Building up a larger scale story with multiple characters takes time, and is not something that always fits nicely in the ever increasing five to six issue sized trade paperbacks we see these days. No, sir, you see Mr. Hickman is playing the long game with Avengers. I’m not even sure we, as readers, could accurately sum up exactly what the main plot or conflict of the Hickman’s run is so far. We do know that things are getting bigger for the Avengers. Eight issues into the series and major players are continuing to be introduced (or reintroduced) every other issue. Personally, I am enjoying the slow burn of Avengers. There are others that want more action, more stuff, now. Boom! Smash! KABLOOIE! If that’s your thing, then there are plenty of other series that can fill the more immediate need of instant story-concluding gratification. Issue #8 is another “slow” issue, but it’s filled with humorous dialog and expanding characterization of some of the lesser known characters. Each member that was brought along interacted with the new Starbrand, and showed us a little bit of who they are as a character. It’s enjoyable and reminds us that some of the characters we met a few issues ago are still around, and still have larger roles to play. By the end of the issue Hickman has also brought events back to the opening issues of his run. We’ve been given only a few of the cogs in this machine, but with each issue we understand more and more how they fit in place. Well, I like to think we understand. Let’s face it, if you haven’t been enjoying the series thus far, then don’t buy this issue. If you prefer long form prose over silly Seuss couplets (you can like both! 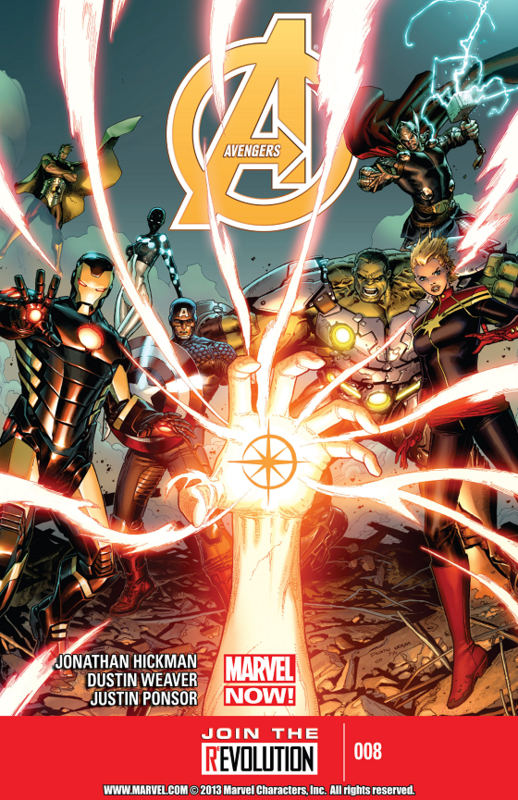 ), then continue to pick up and read Avengers. If you are the more impatient type that marathons through seasons of TV shows in one sitting, then wait for the trades. This isn’t my favorite issue of Hickman’s run so far, but it is by no means irrelevant. Hickman has shown us that everything will all tie together in the end, and we are all hoping it will be a masterpiece. I am loving the craziness that is now the Avengers. Bravo Hickman. I think this will have a great payoff if Hickman sticks to his formula. I do love Hickman’s work and this is no different. I kinda want things to progress a bit more quickly here though.